Nutrasumma® 100% Pea Protein contains only the highest quality isolates from pea protein for those wanting a vegetarian source without soy or dairy ingredients. Pure pea protein offers a superior amino acid profile with more arginine and lysine levels (per gram) than comparable whey protein products. Are you getting enough protein from diet alone? You can eliminate animal products from your diet, but you can’t eliminate your body’s need for protein. In fact, you need between 46 and 56 grams of protein daily — more if you’re an athlete. But according to USDA data, 25% of Americans over age 20 do not get enough! One serving of Nutra Summa Pea Protein packs the same protein content as nearly 5 handfuls of walnuts. Protein plays a role in every healthy human cell. * Many vegetarians supplement their diet with soy protein because it contains all the essential amino acids. Yet soy foods can trigger allergies, inhibit thyroid function, and lower levels of testosterone. Pea protein provides the same essential amino acids soy protein does, without the side effects! 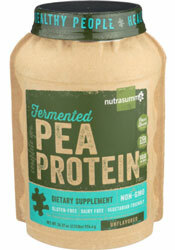 Why Nutra Summa Pea Protein? Absorption: Features protease, an enzyme that breaks down protein, for faster assimilation. 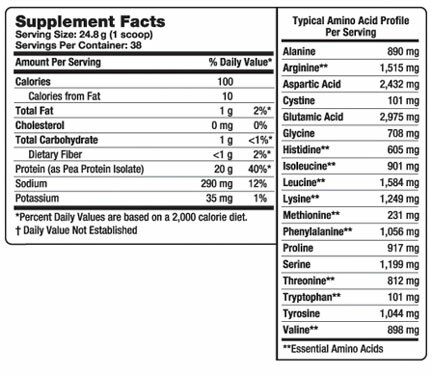 Suggested Use: Mix 1 scoop (24.8 g) with 6-8 fl oz of water or your favorite beverage. Mix in a shaker or blender for 30 seconds. Vary the amounts of water to achieve your desired consistency and taste.